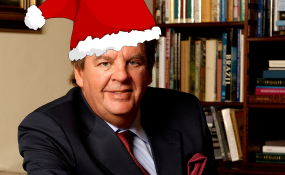 Multi-billionaire and business mogul Johann Rupert has apologised on Twitter, saying he didn't mean to offend anyone. His tweets follow statements he made during an interview on PowerFM on Tuesday night. Rupert was a guest on the Chairman's Conversation, an annual event hosted by the radio station's founder Given Mkhari. During the interview Rupert - who is chair of the Swiss-based luxury-goods company Richemont, as well as of South African-based company Remgro - touched on various topics, including corruption, land expropriation, investor confidence, building a sustainable business, and the Afrikaner Broederbond during a two-hour interview. Mkhari asked Rupert whether he thought the fact that his father had grown up during the Great Depression in South Africa had something to do with his drive and ultimate success in business. Rupert answered yes. "That's the reason... In a sense, the Afrikaner was downtrodden. The poor white question... but they were driven. They studied like crazy, they saved like crazy. "I don't see your generation going to jail for decades, no, you'll miss The Sands," he replied. On Wednesday, the business magnate tweeted: "Apology, no insult intended. I merely replied to a question about how my parents generation lived and saved. Millennials GLOBALLY have different life-styles. (And mentioned that Steve Biko, whom I knew, would not have done it.)" "Taboo and the Sands are two very expensive clubs where copious amounts of expensive French champagne and JW Blue get consumed. Parking lots filled with Bentleys, Lamborghinis etc. pointed out that Given's age group - of ALL colours - behave differently from a previous generation," he wrote. Twitter user Babes KaKendrick commented: "Yeah but we are talking about land that should have been given long before this became a national topic (sic), stick to the topic." Rupert replied that the topic has been a national topic from "The Natives Act of 1913".